U ovih mesec i kusur dana do izlaska filma Solo: Star Wars priča, prava poslastica za sve nas Star Wars knjigoljupce će biti naslov Last Shot, koja izlazi 17.04. 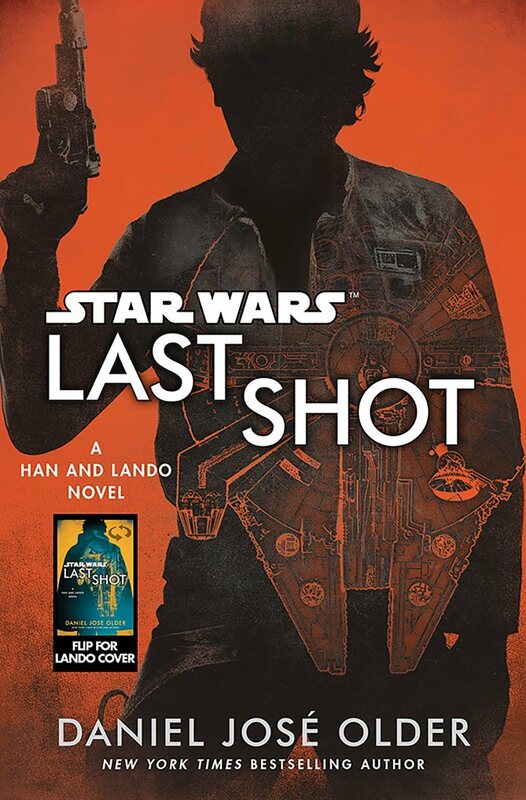 Last Shot, koju piše Daniel Hoze Older, se odvija u nekoliko vremenskih perioda: Prvi se dešava pre filma Solo: Star Wars priča i prati Landa i njegovog droida L3-37. Drugi deo se odvija posle filma i prati Hana i Čubaku pre njihovog pojavljivanja u Novoj nadi. Treći i poslednji deo se dešava posle Epizode VI i prati Leju, Hana, Landa i mladog Bena Sola! Pre nešto više od mesec dana smo dobili izvod ove knjige koji se upravo dešava tokom poslednjeg dela i možete ga pročitati ovde. It was close to midnight, the dawn of a brand-new year; the Empire was creeping its way across the galaxy like a ruthlessly bureaucratic, occasionally lethal fungal infection, and the thriving underworld of smugglers, spice dealers, bounty hunters, and assorted denizens of the crime syndicates that kept them afloat had all gathered to celebrate the coming era of overindulgence and excess. The mind-numbing rickety drum ’n’ drone bursts, moans, and clacks of RevRav and the 4-Pies blurted out across the tenth-level solarium den of Weigh Station Karambola; beautiful women of all species were everywhere looking as fine as they wanted to, and a now fully dressed and manicured Lando Calrissian high-stepped through the revelers, feeling good. The woman smiled with half her mouth and gazed down at Lando, one long-fingered hand on her (full, deliciously thick) hip, the other holding the tube of an elegant smoking apparatus up to her (full, deliciously thick) lips. A glittering gold gown hung off one shoulder and slid down between her long legs, revealing plenty, hinting at more. “Ah, Larren,” Prita said in a sultry whisper. Lando had never been to the Berullian Checkpoint, and the last time he’d seen Prita had been on Pantora, when he’d had to sweet-talk her into letting him fly offplanet with a freighter full of illegally poached forlyn carcasses. It had worked, but he’d had to bust out pretty quick after that and hadn’t had the chance to see if that sweet talk would pay off in any other ways. Prita had never been good with the small stuff, though. Prita locked eyes with Lando, endowing him with her full atten­tion for the first time. Her lips stayed pursed around the smoke tube, but her eyes smiled. That’s it, Lando thought. We have docking clear­ance. He was pretty sure that later that night, when they were lying sweaty and naked in each other’s arms, he would trace the whole thrilling escapade back to that singular eye contact. “We must find a suitable way,” Prita said in a breathy whisper. “I would like nothing mo—” An insistent tug on Lando’s arm cut his words short. He spun around, preparing to let fly a barrage of curses at whatever drunken fool had interrupted him this time. Instead found himself staring into the single illuminated eye of his piloting droid, L3-37. “I need your help,” she said in an accelerated deadpan that Lando had learned to recognize as urgent. Pored ovog izvoda, potvrđeno je da ćemo u knjizi videti i Sanu Staros, koju smo upoznali u prvom poglavlju strip serijala Star Wars. Vaše reakcije na ovaj izvod i očekivanja za ovu knjigu kao i film o mladom Hanu nam ostavite u komentarima. Objavljen izvod iz knjige Last Shot! Najavljena linija knjiga i stripova Han Solo filma! ← Star Wars konvencija 5. maja u Beogradu!